The GemStone/S family of products work together to create a powerful application environment. The GemStone object server is at the heart of a GemStone/S environment. It provides a robust, performant, highly configurable multi-user environment. Smalltalk-based features including indexing and querying, locking, and other features to support application development and optimization. Security features control authentication and access at multiple levels. Highly configurable automatic back-end management to allow tuning for particular application requirements. Full set of administrative tools for monitoring, backup, setting up standby systems, and other tasks. 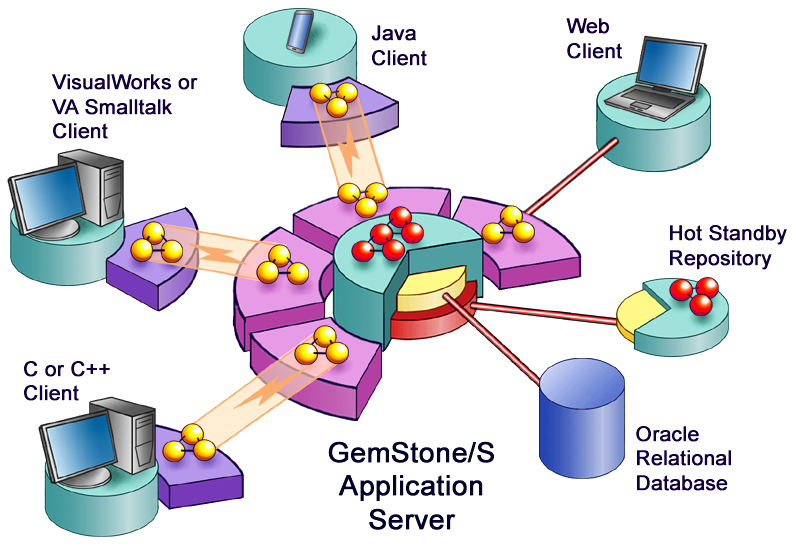 GemStone supports multiple heteroogenus clients, and many thousands of simultaneous sessions can connect to the GemStone/S server. GemBuilder for Smalltalk/VW allows server and client application development from the Cincom VisualWorks environment. GemBuilder for Smalltalk/VA allows server and client application development from the Instantiations VA Smalltalk environment. GemBuilder for Java allows development and client applications to be written in Java, and includes support for Android devices. GemConnect provides an API to interface to the Oracle Relational Database.